You reduce, reuse, and recycle, but is that enough? While making strides to reduce your impact on the environment is incredibly important, it’s also important to get the most out of your efforts. Recycling isn’t overly complicated, but there are plenty of common mistakes we make over and over that make it tough for recycling centers to do their jobs effectively. For instance, let’s say you’re an avid online shopper and have stacks of cardboard boxes piling up in your garage. Tossing the boxes in your trunk and dumping in them in a bin labeled “cardboard” won’t cut it. Unflattened boxes take up prime recycling bin space, so it’s better to break them down at home first. There are other common recycling mistakes that waste your time too. If you think you have to painstakingly peel away labels from used cans and bottles, think again. You can save your time and leave labels on—recycling centers will take care of the rest. Interested to learn more? 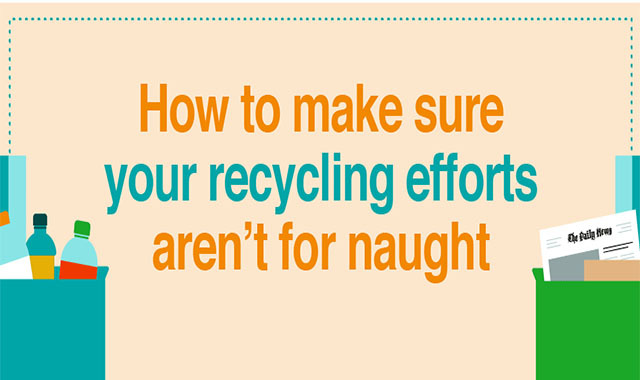 Read on for more tips to make sure your recyclables get where they need to go.